Видимо у MS, что то было с рассылкой писем счастья, поэтому после долгой переписки с поддержкой support@microsoftcommunitycontributor.com с задержкой получил письмо о Microsoft Community Contributor 2012 award. Неожиданно и приятно. К этой категории относятся специалисты, получившие звание по программе Microsoft Community Contributor. Звание Microsoft Community Contributor присваивается за значительные вклады в форумы интернет-сообществ Microsoft, такие как TechNet, MSDN и Answers. Ценность этих ресурсов существенно повышается участниками, добровольно тратящими свое время и энергию на улучшение интернет-сообщества для других пользователей. 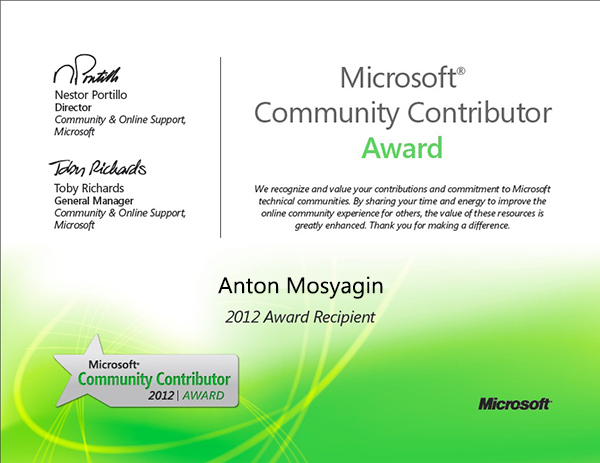 Каждый день по всему миру участники Microsoft Community Contributor Award вносят свой вклад в работу интернет-сообществ Microsoft различными способами, включая предоставление полезных ответов, перевод интерактивных ресурсов на другие языки и работу в качестве модераторов. Congratulations! We are pleased to inform you that your contributions to Microsoft online technical communities have been recognized with the Microsoft Community Contributor badge. This recognition is reserved for participants who made notable contributions in Microsoft online communities such as MSDN, TechNet and Microsoft Answers. The value of these online resources is greatly enhanced by participants like you who voluntarily contribute your time and energy to improve the online community experience for others. First, in the next few days, you’ll notice a «MCC» badge appearing next to your name. This will appear automatically and will remain there for the next three months. At this time we will reevaluate your contribution levels to see if the recognition will continue on a quarterly basis. Additionally, we would like to highlight you on our official badge website. Simply respond to a few questions and we’ll share a little about you with the larger community, including your blog URL, Twitter handle and more. This step is completely optional but will give you some great exposure.